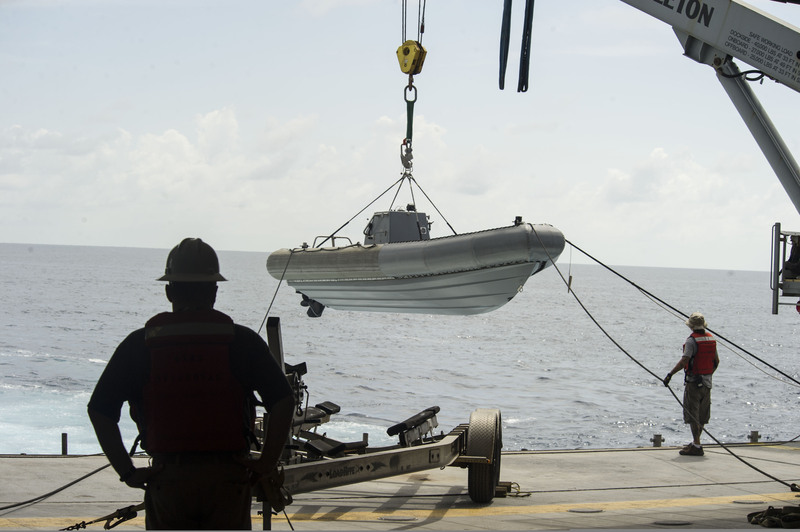 Military Sealift Command personnel aboard the joint high speed vessel USNS Spearhead (JHSV 1) assist with small boat operations in the Caribbean Sea Aug. 24, 2014, during Southern Partnership Station (SPS) 2014. President Obama will be making a short but historic trip to Kingston, Jamaica on the eve of the Summit of the Americas to be held in Panama (April 10–11). During his visit, Obama will meet with the Heads of Government of the Caribbean Community (CARICOM) for discussions on regional security and trade. This presents an opportunity for leaders to discuss how the American-Caribbean strategic cooperation framework can be broadened to incorporate non-traditional security matters, such as climate change. A number of Caribbean islands, such as Jamaica and Trinidad and Tobago, are major nodes in regional illicit networks, which facilitate the movement of illegal goods destined for markets throughout North America and Europe. It is this shared security challenge that has fostered sustained cooperation between the United States and Caribbean states in recent years, including through the ‘Caribbean Basin Security Initiative,’ and will likely remain an active area of cooperation for years to come. Another incentive for U.S. cooperation and leadership in the region is China’s strident alliance building with Caribbean countries, which presents risks to U.S. interests. In this context, the U.S. should explore more ways of enhancing cooperation with its Caribbean partners. More comprehensively addressing the impacts of climate change on the capacities of partner nations would be step in the right direction. Caribbean islands are disproportionately vulnerable to intensifying climate change effects not only due to their small size and location, but also due to economic linkages to environmental conditions. Key industry sectors such as tourism and agriculture rely heavily upon the seas, beaches and ports. This is why climate change effects like sea level rise, beach erosion, and port degradation are causing serious concern across the region. The risk is clear and present when we consider that sea levels in the region are projected to rise by an average of 2 – 3mm per year during the first half of this century – more than double the rate measured twenty years ago (i.e. approximately 1.5 mm per year). Other effects such as longer drought days and episodic flooding across vulnerable areas can have consequential impacts on security, especially when national disaster response and security apparatuses are underprepared. After severe storms, Caribbean military and Coast Guard organizations are often called upon to provide relief and “law and order,” services in support of overwhelmed civilian response organizations. This capability is likely to erode as these storms become more frequent and severe. On top of an increasing workload, the Caribbean operational and training facilities that launch these relief efforts are highly vulnerable to sea level rise. A 2014 joint assessment from U.S. Southern Command noted that “Sea level rise and more intense storms leads to destructive inundation and erosion of coastal [military] facilities.” The report also shared that rising oceans and more frequent storms can have an “impact on facilities’ clean water supplies” and can lead to “increasing maintenance costs.” This degradation in military readiness will also adversely affect the American led counter-trafficking fight in the region since Caribbean security coastal facilities often serve as launching pads for maritime patrols and interdiction operations. This convergence of higher operational tempos and facilities degradation will adversely affect the capacity of Caribbean states to respond quickly and effectively when they, their neighbors and their allies need them most. Expanding assistance for addressing climate change-induced degradation to militaries’ operational readiness (i.e. facilities and installations). More support for response units in the form of capital improvement projects and training evolutions that would help to mitigate the worst damage to security infrastructure that is critical to maritime interdiction operations. More frequent environmental security and disaster-related training exercises designed specifically for mid-to-senior level military personnel. Facilitating action on the aforementioned USSOUTHCOM joint assessment, which recommended “sub-regional working groups (e.g. coastal facilities working group)” to “leverage the advanced capabilities and knowledge of participating member countries,” as well as working groups that address environmental security (specifically, threats to installations, operations and force readiness). Without a doubt, the United States should continue to play a strong supporting role in helping Caribbean states to become better prepared for an increase in crisis response needs, and for maintaining maritime interdiction readiness. The implementation of even a few of these recommendations would measurably advance the U.S. goal of deepening cooperation and access in the region, especially at a time when American competitors like China continue to make significant inroads into the region. In recent months, President Obama has been enthusiastically supportive of addressing the security implications of a changing climate. Hopefully, he will carry this enthusiasm with him to Kingston. By Caitlin Werrell and Francesco Femia in climate and security on April 1, 2015 .